Research in Information Systems at Politecnico di Milano concerns several aspects related to planning and conceptual and architectural design of information systems. Research focuses on initial design phases and corresponding high-level design issues, addressing the alignment between requirements and design solutions. The focus is on evaluating the impact of design choices, on using components at conceptual level for information systems design, on technological aspects of IS development. In particular the research of the group focuses on a number of specific research themes: design of adaptive information systems based on services, process modeling, information systems security, energy efficiency, risk and safety management, representation of spatial information and events, information quality, and sentiment analysis. An overview of the areas, disciplines, and domains considered is shown in the following picture. 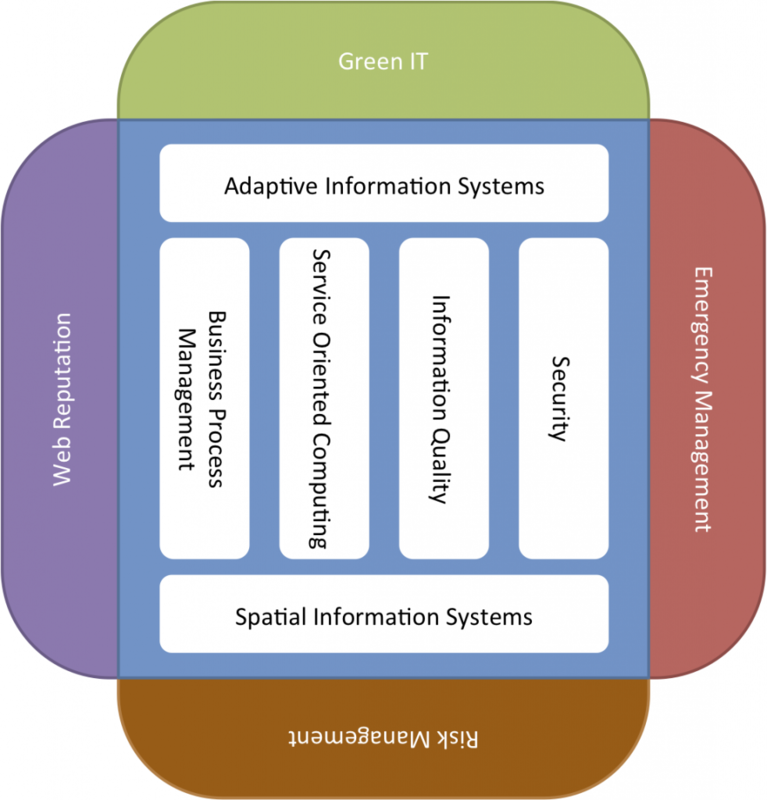 Adaptive Information Systems and Spatial Information Systems represent the foundation of our research. Using Adaptive Information Systems means the possibility for the IS to dynamically change its behavior in order to reach a state in which the user requirements are satisfied. According to this scenario, the research in the ISGroup focuses on initial design phases and corresponding high-level design issues, focusing on the alignment between requirements and design solutions. The focus is on evaluating the impact of design choices, on using components at conceptual level for information systems design, on technological aspects of IS development. Spatial Information Systems are also considered as kind of IS where the problem of spatial data integration and the adoption of workflow technology are considered. Business Process Management, Service Oriented Computing, Information Quality, and Security are the disciplines in which our research has a role. Adaptive processes are considered as a way to dynamically support the execution of business processes. Service Based Computing represents the technological and architectural foundation of our work. Information Quality and Security are some of the main aspects that drive the adaptation.